Nearly 60,000 mounted plant specimens reside in metal cases in the Herbarium of Smith College, housed in the Clark Science Center. 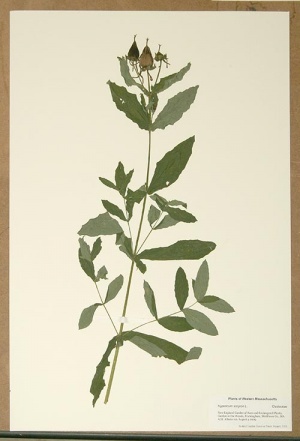 The dried and pressed plants, many dating from the 1800s, were collected locally, regionally, and globally, and document certain changes in these flora over time. Serves as a reference collection for checking the identities of plants collected in scientific studies. Provides material to aid teaching of courses in plant science. Is a historical archive, complementing another great Smith resource, the Mortimer Rare Book Room and its collection of early herbals. Provides a source of materials for botanical illustration. In the memoir The Herbarium of Smith College, C. John Burk observes that the herbarium specimens "represent a botanical resource unusual for a school the size of Smith and uncommon enough in larger institutions."